Two Eagle River’s Justina BigBeaver returns a serve. 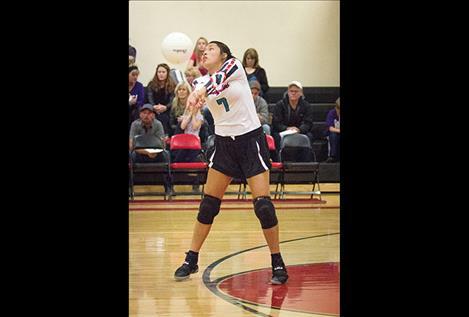 POLSON – Kaelyn Smith put down a game high 15 kills to help Polson sweep visiting Browning 25-15, 26-24, 25-16 in Class A conference action on Oct. 10. For the Lady Pirates, Laurel Bitterman dished out 16 assists and added 4 aces on the night, while Kyler Lundeen had a team high 11 digs. Polson was on the road Thursday and was swept by Stevensville 25-12, 25-21, 25-16 in a non-conference match. Bitterman scored two aces and six assists, while Lundeen had 17 digs and Smith added six kills. LOYOLA – Lady Bulldog Afton Brander had five blocks and Karolyna Buck had nine kills in Mission’s 25-18, 26-24, 25-20 road loss to Loyola on Thursday. Sophia Tolbert had 15 assists and River Gonzalez had 10 digs for the Lady Bulldogs. On Friday, Tolbert had a team high 19 digs and 20 assists in a 24-26, 25-22, 25-19, 25-22 home loss to Troy. Brander chipped in with 11 kills and six blocks. ARLEE – Ashley Revis had 17 of the Scarlets 38 kills as Arlee defeated Hot Springs in four sets 26-24, 22-25, 25-17, 25-19 on Friday. In a Saturday Class 14C match up, the Scarlets swept hosting Noxon 25-16, 25-23, 25-20. LIBBY – Ronan’s Madison Clairmont had three kills, three blocks and seven digs in a road loss against Libby on Saturday. The Maidens were swept by the Lady Loggers 25-5, 25-4, 25-13. PABLO – Two Eagle River fell to visiting Charlo in three straight sets on Thursday and dropped a three-set match 25-7, 25-7, 25-11 to hosting St. Regis on Saturday in Class 14C action. LIBBY – Eric Dolence threw for 187 yards and a touchdown and rushed for 85 yards and a touchdown as the Ronan Chiefs defeated the hosting Libby Loggers 12-8. The Chiefs remain in the playoff picture with a road win in Browning on Friday. POLSON – The Pirates totaled three touchdowns in a 30-19 home loss against the Browning Indians on Friday night. Ryker Wenderoth caught two touchdown passes for 79 yards, while teammate Haden Smith added another touchdown. Pirate quarterback Bo Kelley finished the night 17-of-36 for 239 yards and three touchdowns.